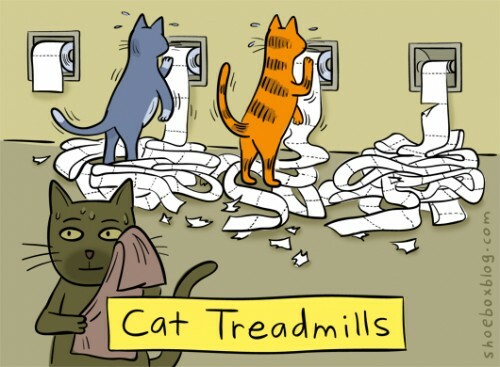 A Tonk's Tail... err, Tale...: Treadmill Tuesday? Mommy's proud to say she works with these crazy people! If you don't regularly read the Shoebox Blog, you're missing some pretty funny stuff. FaRADaY: But WAIT! There's MORE! Maxwell: not today there isn't. Maxwell: Momma sez you need to settle down. Seriously, dude. OMc - That is so cute. You have a very talented mom. Your Mom works for Hallmark! OMC, I'm impressed! No wonder why your blog ideas are so clever. Has Allie gotten on any cards cos that's what I'd love. Oh wait, I already have my own Christmas cards and stamps. Love the clever video. Pee ess: I think Pop has a collection of all the Shoebox cow cards. Yes, Mommy's sooooo not above Nepotism!! Allie is Miss May in this year's calendar for Wayside (pictures to come on an upcoming post!!) - Hallmark uses a lot of wayside Waifs in their cards!! And Faraday & Maxwell have been asked to "model" for the photo studio, too. Ryker was a star i his very own TV commercial back in the day. We'll post that, too, soon! Oh, the film is really nice! So talented! Mowzers, thanks! We'll tell Mommy you liked it! Wow, your Mom works at Hallmark? We just love those Shoebox greetings ... hysterical! You should hear the stories she comes home with - some of the conversations are hysterical, like "if you were an ice cream cone, would your mouth be located in the ice cream or down no the cone..."
Haha! Ernie has been on that treadmill! Maybe your mom can get him on a card??!? HaHaMeow! That treadmill runs non-stop at our house! Wowwie! Me has meeted so many famous peoples - or pets of famous peoples. Yous guys is lucky! Gosh I really really enjoyed that promo film you made! That is just grand :) Great good feelin song with some fun peeps :) Well Done!